Home Expert Advice Skincare Advice Anti-Aging/Wrinkles How Does Vitamin C Help Skin? Vitamin C creates a brighter complexion and evens out skin tone, while diminishing the appearance of fine lines and wrinkles. When added to your daily routine, vitamin C provides a range of benefits, from evening out your skin tone, shielding skin from the visible impacts of pollution, significantly improving hydration, and keeping your skin looking younger, longer! Out of the many beneficial forms of vitamin C, ascorbic acid is a superstar for its proven antioxidant properties that boost firmer-feeling skin. This powerhouse ingredient is backed by research for dramatically brightening and evening skin tone. Visibly Firms, Brightens and Refreshes Skin. Targets the appearance of stubborn spots and wrinkles. When to Use Vitamin C in Your Skin Care Routine? Vitamin C has a unique status—skin care experts around the world consider it an anti-aging superstar. At Paula’s Choice Skincare, we follow the latest research on vitamin C, and are excited to share how you can incorporate this powerhouse antioxidant ingredient into your skin care routine, no matter your skin type or anti-aging concern. There are many forms of vitamin C, and many of them are great for skin—we’ll get to which types work best shortly. They all have potent antioxidant and anti-aging benefits that help mitigate problems both before and after they occur. When added to your daily skin care routine, well-formulated products containing vitamin C provide a range of benefits, from helping to even out your skin tone, shielding skin from the visible impact of pollution, significantly improving hydration, and keeping your skin looking younger, longer! When properly formulated (this ingredient is finicky), ascorbic acid helps create younger-looking, firmer-feeling skin while signs of uneven skin tone and spots seem to disappear. Ascorbic acid also helps skin’s surface defend itself from external stressors, lessening the effects of exposure to the elements. There’s more: Ascorbic acid is a powerhouse when mixed with other antioxidants. That approach is the fundamental philosophy here at Paula’s Choice Skincare. One ingredient, no matter how amazing, is never enough to take the best care of your skin. We are particularly proud of our two high-concentration vitamin C products that provide targeted solutions for stubborn skin care concerns, no matter your skin type. 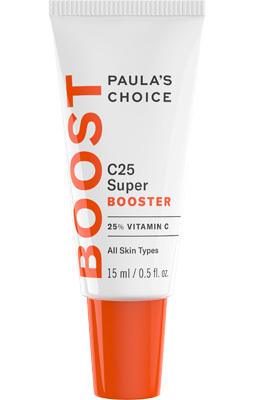 Our C25 Super Booster can be used over problem areas and our C15 Super Booster can be used all over to refresh, visibly firm, and renew skin, with noticeable results that improve the look of skin imperfections. While we love our high concentration vitamin C products, those with lower concentrations also provide stunning results. The higher strengths have benefits for specific concerns, but the lower strengths in some of our moisturizers, toners, and serums also help replenish skin in significant ways, and work beautifully with other beneficial ingredients such as retinol and niacinamide. Although ascorbic acid is definitely an outstanding form of vitamin C, there are other forms that also have notable research demonstrating their stability (when compared to pure ascorbic acid) and efficacy. Those forms include sodium ascorbyl phosphate, ascorbyl palmitate, retinyl ascorbate, tetrahexyldecyl ascorbate, magnesium ascorbyl phosphate, and ascorbyl glucoside. 3-O ethyl ascorbic acid is another, although this relatively new form of vitamin C doen’t have much peer-reviewed research behind it yet. Nevertheless, all of these are worthy of your attention when included in a superior moisturizer, serum, essence, or toner. Keep in mind that all antioxidants, including pure vitamin C and its more stable variations, remain vulnerable, and will break down if routinely exposed to air and light. That means if you want to get the best possible results from your antioxidant-enriched skin care products, then buy only those that are packaged in opaque tubes, air-restrictive bottles, or pump containers so the ingredients remain stable after you start using the product! A vitamin C product in a jar isn’t a good purchase! The Best Skin of Your Life Starts Here: The same type of in-depth scientific research used to create this article is also used to formulate Paula’s Choice Skincare products. 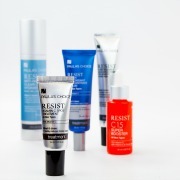 You’ll find products for all skin types and a range of concerns, from acne and sensitive skin to wrinkles, pores, and sun damage. With Paula’s Choice Skincare, you can get (and keep) the best skin of your life! 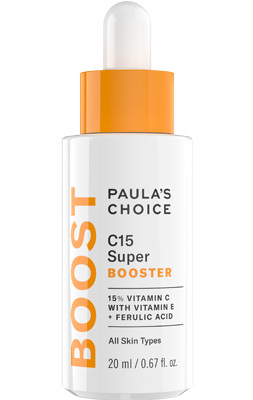 See Paula's Choice Vitamin C products.